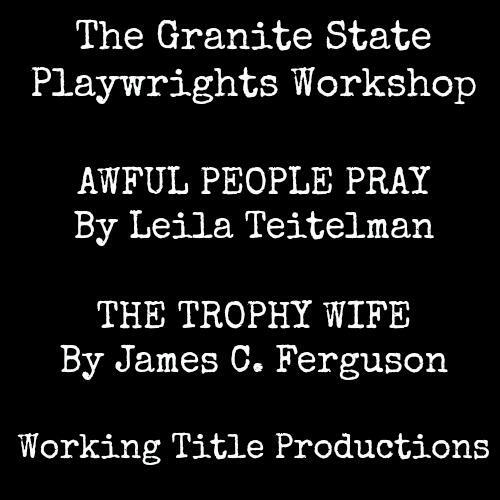 Join Working Title Productions for their second Granite State Playwrights Workshop, a performance featuring staged readings of two plays. The first, The Trophy Wife by James C. Ferguson of Plainville, MA, follows Amanda and her daughter Talia as they try to determine what should be done with Amanda’s deceased husband’s store, a trophy shop called The Trophy Wife. The second, Awful People Pray by Leila Teitelman of Keene, NH, follows the lives of three camp counselors. Jade, a new counselor, is a trans woman and is weary of the negative reactions this could garner from parents and campers alike. This play contains: Adult Situations, Simulated Violence, Sexual Situations, and Sexual Violence.